Escape from the noise with the delightful sounds of nature. For those who enjoy the comforting nature sounds. Nature Soundscapes offers a wonderful way for you to close your eyes and relax with sounds. 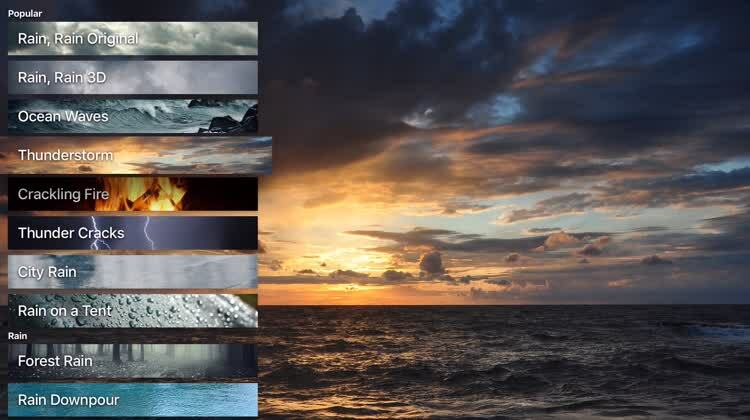 Choose from tranquil ocean waves, a comforting falling rain, a gently clapping fountain, or calm brown noise. The app has a convenient sleep timer and an option to turn off the display, making it an ideal tool to help you fall asleep. For comforting sounds to help you sleep or just enjoy a little peacefulness, Nature Soundscapes provides four relaxing options. With more than just rain, you can fall asleep to the exact sounds that make you drowsy. For those who fall asleep easier by hearing the hum of a plane or cracks of thunder. Rain Rain Sleep Sounds provides a big variety of storms and downpours along with soft and pleasant rains. In addition, the app has sounds for nature like winds and streams, transportation such as airplanes and trains, and even appliances like a washing machine and dishwasher. 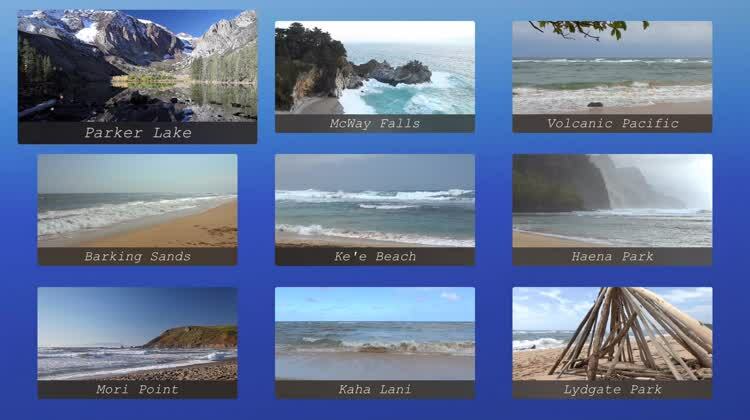 The static images provide nice pictures and the matching sounds are perfect to help soothe you. 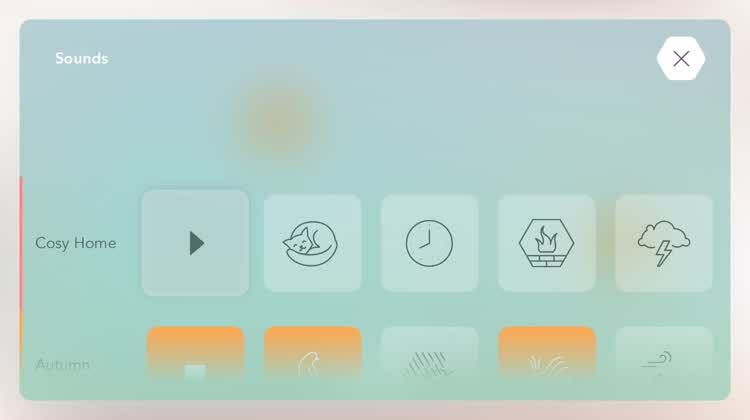 If the hum of an airplane or gently dripping water is what makes you drowsy, then Rain Rain Sleep Sounds is the Apple TV app for you. It offers many different rain sounds, as the name implies, but also provides other sound options to help you fall asleep. Pick the perfect background sound from a terrific list of options. For those who love an array of sound options. White Noise has a wide range of options for the exact sound you want or need. Whether you are ready to unwind, attempting to focus, or trying to fall asleep, the app has you covered. The static images are attractive, but do not distract from the sound you choose. If you prefer to see a clock display, you can select it and still hear the audio, making it a great Apple TV app for background sound. For any mood, occasion, or taste, White Noise has a sound to fit. 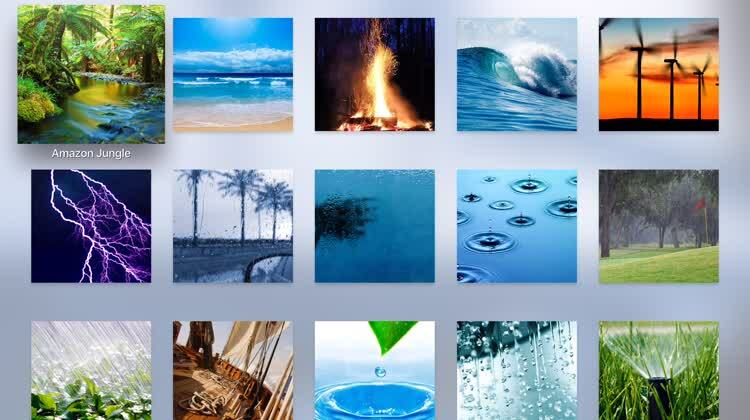 For help relaxing, concentrating, or staying calm, this app has a wonderful array of options. Relax with stunning sights and soothing sounds. For those who appreciate beautiful scenes with tranquil sounds. Atmo: HD scenes of Aquarium, Fireplace and Nature provides comforting visual and audio effects for unwinding after a long day. Choose from a calming fireplace, relaxing river morning, or a tranquil aquarium. Each stunning display is complete with peaceful sounds to match and more are available via in-app purchase. 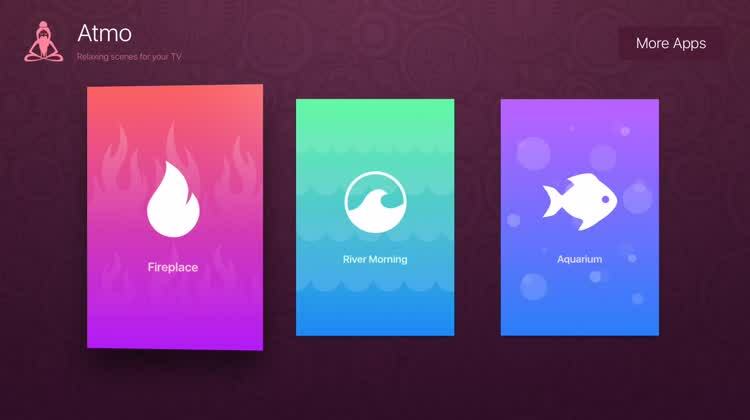 With simple yet beautiful scenes, Atmo: HD scenes of Aquarium, Fireplace and Nature provides high-quality visuals with peaceful sounds making it perfect for any relaxing occasion. Create the perfect mix of sounds to help you unwind. SoundShade offers a unique set of customizable sounds for every taste. Choose those from the forest like birds and wind or from the home such as a fireplace or clock. Then mix the sounds on the main screen by moving them to different locations. This will allow you to create the perfect volume for each sound and the overall effect. If you like to create your own soothing sound mixes, then SoundShade is the app for you. Combine sounds from indoors and outdoors to produce the perfect calming effect. For those who like to relax with nature’s sights and sounds. 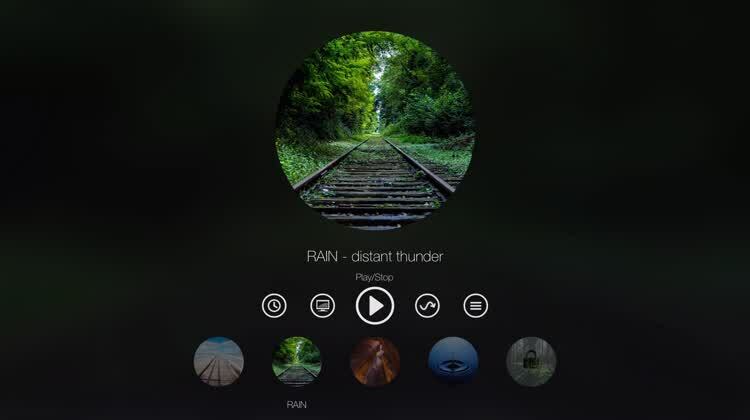 Unwind to the realistic sounds of a thunderstorm. For those find the sounds of thunderstorms soothing. 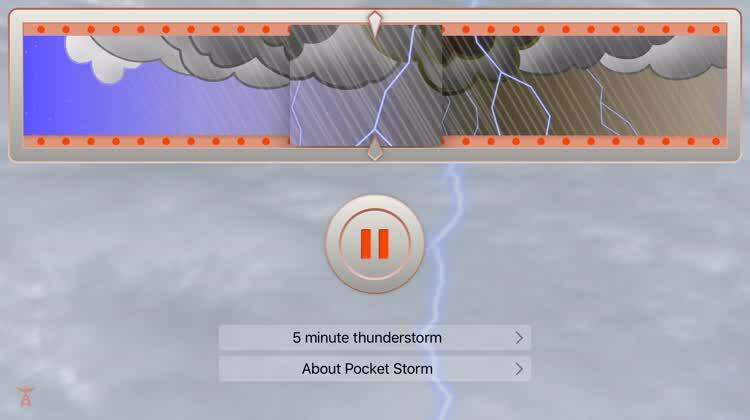 With Pocket Storm you can listen to the sounds of a storm moving in from the distance and then fading away. It starts with calming nature sounds and then soon the thunder begins. You can set the duration of the thunderstorm from five minutes up to one hour to experience the entire cycle no matter which you choose. If thunderstorms moving in and out create a relaxing atmosphere for you, then Pocket Storm is your perfect calming companion.